Give your kids a head start in life with a healthy level of focus, discipline, confidence, respect and grit. Learn a little about our programs from ages 4-15 then contact us below or at call 206-789-2411 anytime. Looking for martial arts or karate classes for kids near North Seattle? We have the most unique and effective kids martial arts program in Seattle for children between 4 and 15 years of age. It’s a great alternative to karate or tae-kwon-do! Nobody sits on the bench in our school. Your kids will learn many skills! Our multi-cultural approach to martial art allows us to create an always evolving, always interesting experience for kids of all ages. Kids will learn about, experience and integrate elements from the martial cultural heritage of Thailand, China, the Philippines, France, Brazil and more. One of the biggest lessons they’ll learn is that the different arts and cultures each have something to offer and when they work together something beautiful happens. As kids learn the martial arts they gain control of their bodies, build up their confidence in defending themselves, the self-respect and pride of overcoming their fears and setting and accomplishing goals. The psychological benefits are first to manifest. Psychologists agree that the need for ‘safety’ is paramount for human beings to thrive. Pretty soon the anxiety about bullies and other stress begins to melt away and they can focus on school and just being a kid. We will help your child to feel more secure through knowledge of self defense. Using the techniques of the martial arts, from basic to advanced, your child will learn physical attributes such as coordination, balance, fitness and self-defense as well as lasting life skills such as focus, confidence, respect, persistence, teamwork, and kindness. For ages 4 to 6, our Lil’ Ninjas program focuses on improving basic motor and listening skills for preschool aged children in a fun and motivating way. 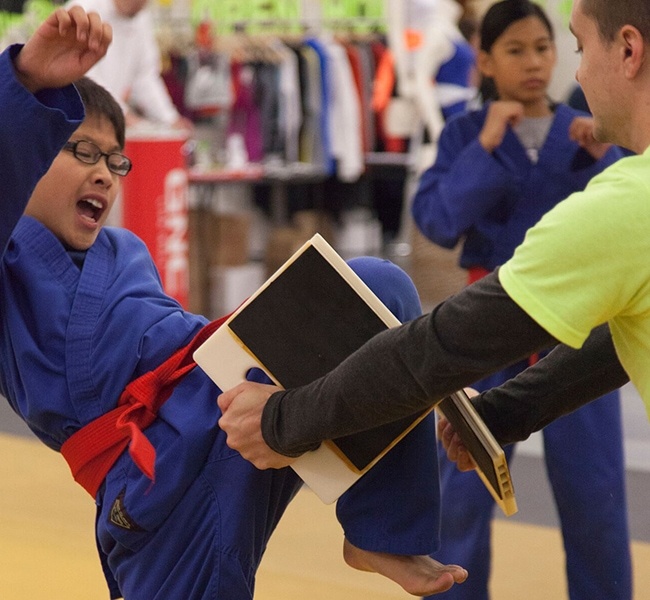 The curriculum uses martial arts techniques and games to help your child develop 8 major skills that are necessary for participation in any sport or activity: focus, teamwork, control, balance, memory, discipline, fitness and coordination. For ages 7 to 11, not only will your child work towards one of the world’s most coveted goals, a Black Belt, but our multi-cultural curriculum will teach them about other cultures, perspectives and methods. 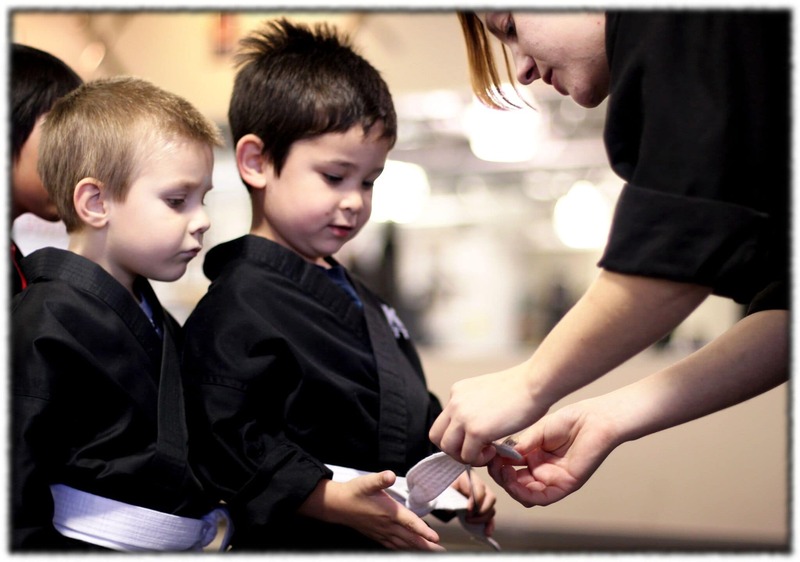 Our Junior Black Belt curriculum will improve focus, self-discipline, and coordination. Activities such as black belt assignments, word of the week, in-class discussions, and games will be used to encourage our students to excel inside the classroom and out. As the students learn and progress they will earn belts at the beginner, advanced beginner and intermediate levels. After these accomplishments the final push towards Black Belt will be made by upgrading to the Black Belt Club for one more day of training each week. For ages 12 to 15 our teen martial arts for kids program continues the trend of personal effort and achievement established in our other kids classes but prior participation is not required. Discipline, Focus, and Goal Setting are emphasized through the introduction of more advanced techniques from our core martial arts of Filipino Kali/Arnis/Escrima, Muay Thai Kickboxing, Western Boxing, Chinese Jun Fan Jeet Kune Do, and Brazilian Jiu-Jitsu. Personal awareness, community service, responsibility, and leadership are considered a vital part of our teen class, as students learn new degrees of control and patience through the completion of homework assignments, in-class activities, and mentoring our younger students. Every Friday from 3:45 to 4:30, the floor is reserved for Juniors and Teens to come in to train and practice. Instructors will be on the mat to help out, answer questions, and facilitate training. This is a great time for students to prepare for tests, test for colored tips, or work on a move that they are having trouble with. For the more dedicated student we also have additional programs such as a Demo Team, Black Belt Club, Leadership Development, and more designed for youth and teen students who have demonstrated an outstanding effort and want to take their training to the next level. We also try to develop a deeper appreciation of the martial arts and an alternative image of MMA we call True MMA. Rather than create a method of mixed martial arts to compete in the ring we try to emulate our adult programs and teach our BBC members to appreciate the deeper levels of artistry embodied in our mission statement: True MMA. Black Belt club is MKG’s Advanced class for the Junior and Teen programs. In Black Belt Club students are challenged to work at a harder pace, and given material of a more difficult nature. Any student of Orange Belt or higher can inquire about joining Black Belt Club. Held on Friday afternoons from 4:30 till 5:30 Black Belt Club students are given a special uniform to indicate their dedication to the arts, and are given free admission to the Friday Seminars that are held throughout the year. Leadership team is a group of advanced students who have chosen to learn new skills to help teach martial arts to other students. Student leaders assist in classes with younger or less experienced students in order to provide more personal instruction and encouragement. These students learn valuable communication and teaching skills while also learning to serve others. Serving others provides leaders with the opportunity to develop patience, humility and kindness. These traits are essential to students who aspire to be a true black belt of the martial arts. Leadership team is only open to students who demonstrate leadership qualities in their classes already. Any student with a Blue Belt or higher can request to be admitted to leadership team. Any student with an Orange Belt or higher can be invited by the instructors to join the leadership team.